We’ve been living the snow globe life in New England. The Boston blizzards of 2015 dumped snow everywhere! I’ve been coping by catching up on my baking and cooking. It keeps the house smelling homey and warm. 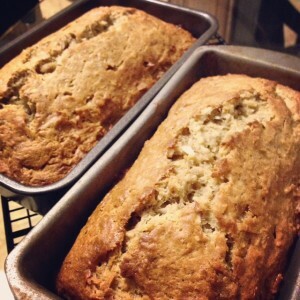 I love banana bread. The depth and intensity of banana and coconut flavor in this quick bread is always comforting and feels like home. I especially love a piece of banana bread lightly grilled on a skillet with a spat of butter. Yum! The key is having super ripe bananas and not over mixing the batter. I leave bananas out to ripen in my kitchen until they turn black and then hoard them in freeze until there’s enough to work with. Weigh out key ingredients. Use the right sized pan. If you don’t, the baking time will change. This is especially important when baking breads with yeast, which impacts the rise. Even without yeast, you can see in the photo above the difference in texture in using the right pan versus using a slightly bigger pan. You can use an egg substitute and margarine if you’re trying to avoid eggs and dairy. If you like nuts, add in 1 cup of toasted walnuts, macadamia, or your favorite in with the dry ingredients. Preheat oven to 350 degrees and adjust the oven rack to the lower-middle position. Grease two 8 ½ by 4 ½ inch loaf pans with coconut oil. In a large bowl, combine flour, brown sugar, raw sugar, flaxseed, almond meal, shredded coconut, baking soda, and salt together. In another large bowl, whisk mashed bananas, zucchini, melted butter, eggs, coconut milk with cream, and vanilla together until well mixed. Carefully fold the banana mixture into the dry ingredients in the first large bowl until just combined. Pour batter into pans. Bake for about 55 minutes until golden brown and a toothpick comes out clean with a few crumbs when inserted into the middle of each loaf. Cool before serving. Enjoy! ← Welcome our newest family member FoodyDirect!